Yesterday, as I was stealing grabbing a cover pic from GoodReads for my Rebirth review post, I discovered Sophie Littlefield wrote a novella between Aftertime and Rebirth entitled Survivors (Aftertime #1.5). Naturally I scooped it up on my Kindle and gave it a read! 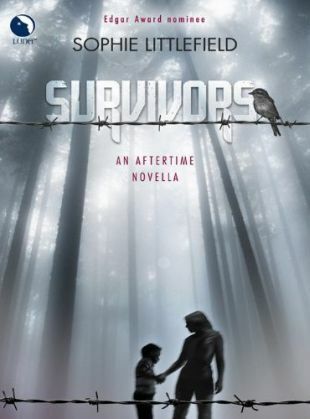 If you have read (or plan on reading) Aftertime, read Survivors before moving on to Rebirth. I wish I had! The second book Rebirth takes places a couple of years after Aftertime. Survivors, however, gives you insight into how life was for Cass and Smoke (and Ruthie who seems to sleep 99% of her life) shortly after the end of book one. I had an issue with not liking the characters in Rebirth, but they are quite likeable in Survivors and that likely would have carried over some into Rebirth. This is a short novella, but it was a good dose of Littlefield's Aftertime world and a quick shot of some more zombie goodness. Update: You can get Survivors for free on Amazon right now. I assume it is a limited offer as I just paid $2.99 for my copy.